We love meals that can be made in advance, stored in the refrigerator, and popped into the oven after getting home from work; this also works great when prepackaged into grab-n-go lunches. Most of all, though, we love meals that are easy to make and feature lots of flavor and local ingredients. Try this southwestern-inspired casserole instead of a carb-heavy lasagna or spaghetti. And, yes, you can serve it with a side of tortillas and red chile sauce! 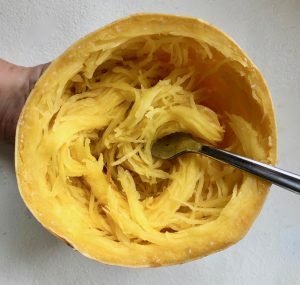 Cutting the spaghetti squash in half crosswise is easier than cutting it lengthwise. 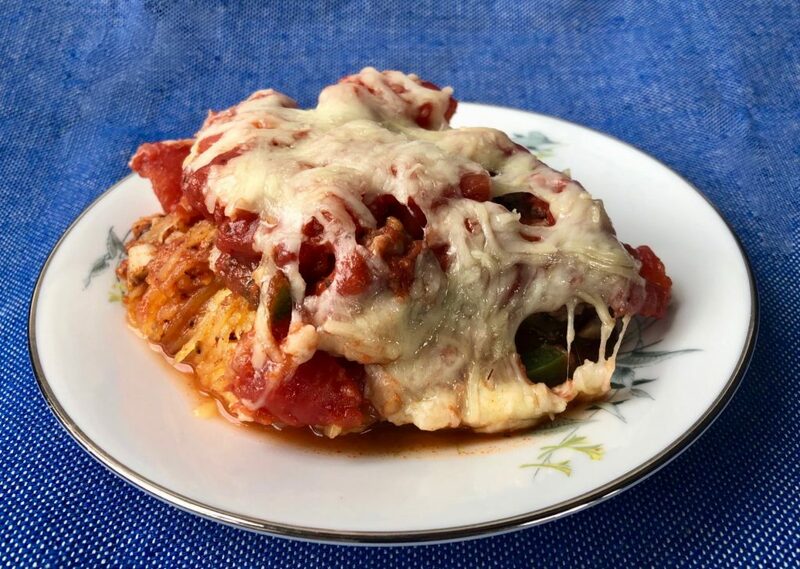 Lay the cooked spaghetti squash in the bottom of a baking dish as the first layer of the casserole. 2) Cut the spaghetti squash in half crosswise (it’s easier than cutting it lengthwise). Scoop out the seeds and stringy guts. Lightly oil the cut side of the spaghetti squash, place it face down on a baking sheet, and bake for about 40 minutes, or until fork-tender. You can also cook the squash in a pressure cooker, like an Instant Pot, for 15 minutes. 4) Turn the oven down to 375°F. 5) Heat a skillet over medium heat, add the teaspoon of oil to the skillet, then add the chopped onion and garlic. Sauté, stirring occasionally, for about five minutes. Add the chopped jalapeños, red chile powder, salt, and pepper. Stir for about three minutes until the ingredients are fully incorporated. 6) Add the turkey to the skillet and cook through, breaking up the meat into crumbles as it cooks. Turn off the heat under the skillet after the turkey is cooked. 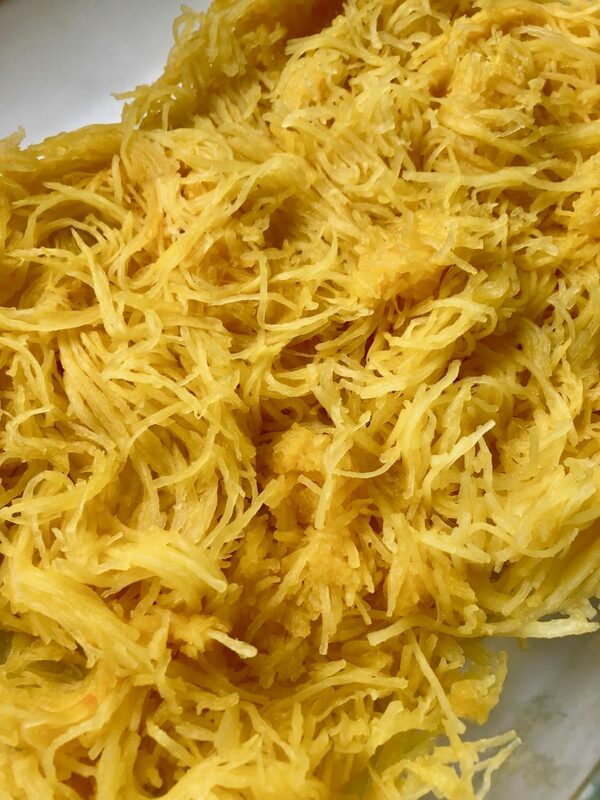 7) Using a fork, tease out all of the spaghetti-like tendrils from the spaghetti squash . Place them in the bottom of a 9-inch by 12-inch baking pan (no need to oil the pan first), as the first layer of your casserole. 8) Add the turkey mixture in a layer on top of the spaghetti squash, then the layer of tomatoes (fresh or canned). Top with the cheese. 9) Bake the casserole for about 25 minutes, or until the cheese is bubbly. This casserole can be made in advance and popped in the oven for a quick dinner, or sliced into portions for prepackaged lunches.